Israel has demanded an explanation from Argentina over reports it proposed to Iran it would stop investigating two bombings if trade ties improved. Argentina, Israel and the US have blamed Iran for the bombings of the Israeli embassy and a Jewish community centre in Buenos Aires in the 1990s. Iran has denied involvement in the bombings, which killed 114 people. An Israeli spokesman said if true, "it would be a display of infinite cynicism and a dishonour to the dead". A car bomb exploded outside a Jewish community centre known as the AMIA on 18 July 1994, killing 85 people. 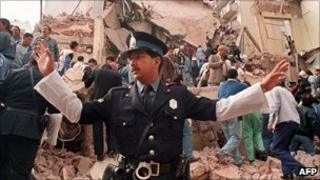 Twenty-nine people were killed two years earlier when a bomb destroyed the Israeli embassy in Buenos Aires. The report about a putative deal appeared on Saturday in Argentine media. The newspaper Perfil quoted a leaked Iranian diplomatic cable that detailed the offer. The cable reportedly said: "Argentina is no longer interested in solving those two attacks, but in exchange prefers improving its economic relations with Iran." According to Perfil, Argentine Foreign Minister Hector Timerman made the offer through Syrian President Bashar al-Assad in a meeting in Syria in January. Israeli foreign ministry spokesman Yigal Palmor said Israel wanted "official clarifications by the Argentinian Foreign Ministry concerning the article". Israeli media reported on Sunday that the foreign ministry was considering cancelling a planned visit next week by Mr Timerman if the reports proved to be reliable.